If you look at a very long term chart (20+ years) you will see that this trend built a solid base from which to take off. The Mexican markets reached a peak in early 1994 and didn’t revisit that level until 2004! After basing just under the resistance level (~11,000) for a few months, they broke out in late 2004. And never looked back. Until last year, Brazil (EWZ) was the strongest Latin market. Then it faltered and was overtaken by Mexico. 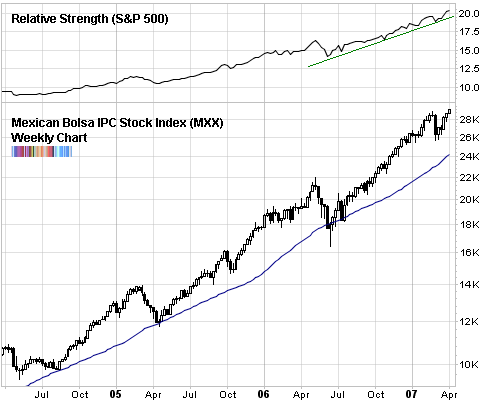 Also notice how the relative strength of the Mexican market was extremely strong against the S&P 500. Even after each pullback the trendline of the relative strength was not broken. They were merely dips within a march upward. So, is it too late to jump in? Well, considering that the base was 10 years in the making, a measured move would also last approximately 10 years. We’re in the 3rd year, so we have quite a ways to go yet. That being said, I wouldn’t just jump in headfirst. Wait for a pullback, especially to support levels or to a long term moving average (or sweeter still, the conjunction of both). And if you’re a short term trader, put it up on your watchlist. It is almost in ‘free air’ territory again (meaning that every long is happy). We could have a breakout and long range day today if it breaks out of the mid-February resistance level. Another way to play this is to not use the ETF (EWW) but to drill down to the components and find the strongest individual stocks and play those on the long side. The advantage is that you’ll get more beta for your bucks, but you’ll probably be stepping in much less liquid securities. EWW, along with EWZ, have been a tend follower’s dream come true. I prefer trading the ETF just because it’s a little safer, but you hit the nail right on the head about the Mexican exchange. It almost makes trend following seem too easy!